It might be July, but Goodyear has just released its newest winter tire built specifically for SUVs and crossovers. It’s called the UltraGrip Ice SUV and it promises to offer better extreme cold weather traction than other dedicated winter tires. Yep, it’s supposed to outperform other winter tires when the mercury drops to arctic-type conditions. Goodyear says the secret is in the rubber compound and complex tread sipping. The compound, called the IceGrip compound, maintains a greater degree of flexibility at extremely low temperatures. This gives the tire a better chance at keeping traction beyond temperatures that most winter tires begin to harden up – and well beyond the point all-season tires become blocks of hardened rubber. Second only to the compound, tread sipping is the most important aspect of a winter tire. The UltraGrip Ice tire uses angled and interlocking sipes that both grip the road and resist squirming. On top of that, the tire is designed with heavier vehicles in mind. The tread pattern is wider than most winter tires, giving the UltraGrip Ice a larger contact patch for better grip. Goodyear calls this its ActiveGrip Technology. All this leads to better cornering stability and shorter braking distances – two things critical when driving in snow and ice. Further helping owners get the most from their tires is Goodyear’s TOP indicator. Small snowflakes are seen in the tread pattern when the tires are new. As they age with mileage, the snowflakes become shallower. When the snowflakes are gone, it’s time to replace the tire. This occurs at roughly 25 percent tread depth. That might sound premature, but tread depth is extremely important at whisking away snow, ice, and water. The rubber compound is the biggest difference between a summer performance tire, an all-season tire, and a winter tire. It’s the chemical makeup of the rubber that allows these different tires to perform in these very different environments. For Goodyear’s UltraGrip Ice SUV tire, its compound is formulated to surpass the performance of other winter tires during extremely cold climates, like those found in the Arctic Circle. Sipping on a winter tires is crucial for getting and maintaining grip on the road. The wavy sipes essentially increase the biting edges on the tire, helping it claw its way through slippery conditions. Goodyear’s interlocking sipes on the new UltraGrip Ice SUV tire are specifically cut so they resist squirming under the heavy weight of modern SUVs and crossovers. The contact patch is basically the tire’s footprint. Like those wide summer performance tires found on sports cars at the track, the more surface area, the more available grip. Even throughout the UltraGrip Ice’s variety of sizes, the tire offers a wider contact patch than many of its competitors, delivering better handling in adverse conditions. What’s more, Goodyear’s ActiveGrip technology is said to more evenly distribute the vehicle’s weight across the contact patch. Of course, a tire’s health is important. Tires lose tread depth as they rack up miles, making them more susceptible to hydroplaning over water or packing mud or snow. Goodyear helps keeps owners informed of the UltraGrip Ice’s tread depth with the TOP Indicator. The snowflake design is at full depth when the tire is new, wearing down as the tread depth diminishes. When the tread has roughly 25 percent life left, the snowflake is gone, indicating it’s time to replace. Think of it as a more advanced type of wear bar indicator on regular tires. As I mentioned earlier, 25 percent tread depth might seem a bit premature, but when it comes to winter tires that constantly deal with snow, water, and slick surfaces, it’s best to replace tires before they loses the ability to grip. Worn winter tires do no good if it hydroplanes the vehicle into a ditch or fails to grip ice-covered surfaces. The best AWD or 4WD system is useless if it can’t put power to the pavement, nor can the most advanced ABS or stability control system control a vehicle without traction. That’s why winter tires are so important. The combination of wintertime rubber compounds and tread designs give winter tires the advantage over all-season, three-season, and even all-terrain tires. For those with SUVs and crossovers advertised as go-anywhere vehicles, tires are generally the weakest link. That’s why swapping out those all-season tires during the winter months can greatly increase a vehicle’s grip and safety. 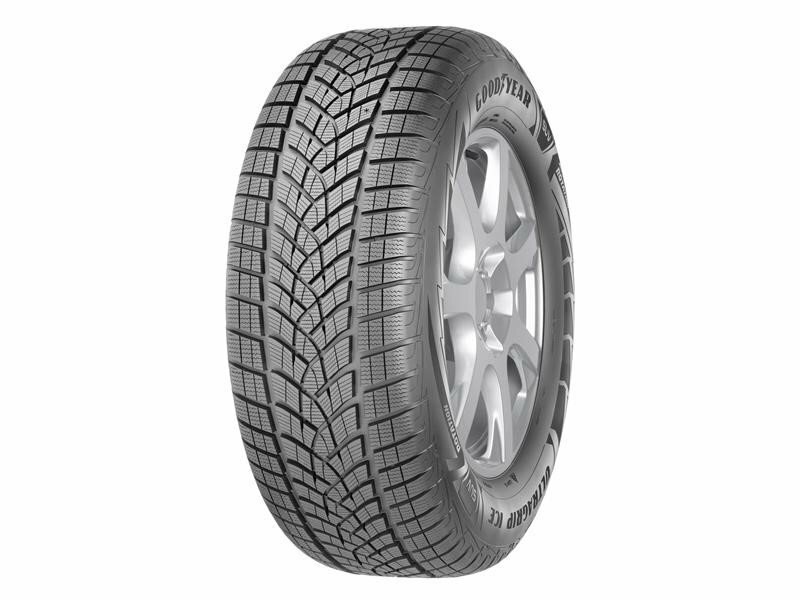 The Goodyear UltraGrip Ice SUV tire became available July 1, 2016 and comes in 14 sizes that fit 47 percent of world’s SUV and crossover market.